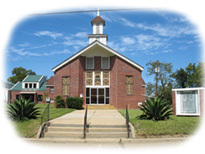 College Hill Missionary Baptist Church was organized in 1907 under an oak tree on the south side of Florence Avenue in west Jackson approximately 100 yards from its present site. College Hill Church emerged from humble beginnings and has made continual advancement in all phases of development. After an initial period of services in Robinson Hall, located on Rose and Pascagoula streets, the present site was set aside by Dr. L. G. Barrett, the second president of Jackson College (now Jackson State University), as a gift to the people of west Jackson for religious services theory. Thus the bond between this church and the college was formed. The designated tract was to be used for none other than religious purposes. The church was a frame building with no classrooms, kitchen, nor plumbing. After growth in membership, some renovations were made. In 1957, under the leadership of Reverend W. L. Jones, the old church was pushed back and turned around, and a new brick edifice was started. The building was completed and dedicated in September 1957. Under the leadership of Reverend R. E. Willis, the Education Building was completed in 1967. The sanctuary was modernized and the church grew to full-time worship and an organization composed of various auxiliaries. Under the leadership of Reverend Hoses J. Hines, College Hill experienced tremendous growth through restructuring, revitalization and the initiation of new ministries. With Evangelism as the focus, membership increased dramatically and the budget grew consistently - College Hill moved to two Sunday morning services, 8:00 and 11:00, with religious study, service and activity throughout the week. for the future is evangelism (Matthew 28:19-20). College Hill shall continue with its rich legacy as we face the challenges of the future.